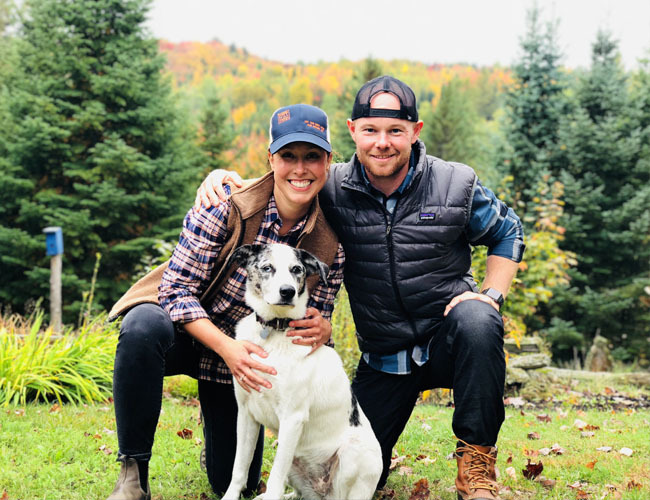 Meet Chris, Katie and their dog Skyler! These avid outdoor enthusiasts, cyclists and New England natives are thrilled to provide you with a comfortable stay and memorable experience. The Wooly Buggah Farm was a spontaneous leap out of the city, having both lived in Boston for over 15 years. Chris, a top fitness professional, has been a private in-home trainer while leading the charge in Boston’s group fitness scene for over 15 years. He created the #1 booked strength-endurance class at Equinox Financial District, CrossCycle®. Combined with over 20 years of professional mountain bike racing experience, Chris is ready to offer you an array of fitness adventures for any ability whether your stay is a few days or weeks. Katie is the Sales Director at Jasper Hill Farm, a raw milk cheese maker based in Greensboro, VT. She calls on her decade of sales, marketing and event planning experience to share the farm’s incredible cave aged cheese with the world. With a passion for food and wine, Katie loves providing guests with unique culinary experiences and warm hospitality. Be sure to enjoy a private local cheese and beverage pairing with Katie during your stay. Stay with Chris and Katie for a Vermont vacation you won’t forget. What a wonderful, picturesque, stay we had at the Wooly Buggah Barn! Clean, cozy, and just stunning. Great place to stay in the NEK, with great hosts, and their pup! 10/10 will come again. What an awesome stay - we're already dreaming up our next trip to the Wooly Buggah. Beautifully renovated barn with everything you could need and nothing that you don't. Chris made our stay extra special with a bonfire and warm croissants from a local bakery. And don't get me started on the view... what an awesome spot - cheers! Minutes from the Kingdom Trails Mountain bike facility and Burke Mountain, The Wooly Buggah Barn is your home away from home. This place is a brand new renovated barn that sleeps up to 7 people. The kitchen and bathroom are nicer than mine! The owners Katie and Chris are awesome, and they have the friendliest dog Skyler. We were lucky enough to stay at Wooly Buggah Barn for 3 nights at the end of September. Our group consisted of 4 adults and one toddler. The barn is beautifully furnished with everything we needed for our stay. The kitchen is fully stocked with comfortable eating and sitting areas. The two bedrooms are nicely furnished with multiple sleeping arrangements with comfy mattresses for a restful nights sleep. Views from the property are spectacular!!! We will definitely stay here again! We love visiting the Wooly Buggah Farm with CrossCycle Adventures! Just a few minutes from the Kingdom Trails, beautiful views and the perfect place to relax after a day of mountain biking. I'm a beginner, but with our awesome CrossCycle guides I felt totally safe and comfortable on the trails and can't wait to come back! We would love to hear from you! Please complete and submit the form below with any questions and we will get back to you at our earliest convenience. Please contact us directly by phone or email with any questions. We look forward to speaking with you.